← From Vimeo to Periscope. Do we really need another video app? Book Book is for the birds. Unless you want a cracked iPhone screen. I was soooo happy when my Book Book iPhone 6 Plus case first arrived. You know, the phone case that looks like an old book from Twelve South. I made several videos illustrating my unbridled glee before settling on this. I had slits for my credit cards, a clear panel for my license and could hold a couple of dollars nicely. There was no way to keep it closed, but laying on a surface, the cover stayed firmly on the screen. After all kinds of iPhone cases – Otterboxes, bootleg LV wallet, Targus, this one, that one – I felt that I had arrived. With the Book Book, I had stepped up my phone case game. My iPhone was nestled snugly in a case that protected it from the elements and looked stylish to boot. Oh! The compliments I received! Each new outing brought hordes of admirers, cooing at my case, remarking on the weathered look of my Book Book comme iPhone case. My glee was short lived however, the first time the phone dropped. My pride turned quickly to horror as my phone slid off my lap and (in slow motion) opened up like a small black bat taking flight. But instead of darting off herky jerky, it made a beeline to the hard unforgiving ground, landing with a resounding slap. Nauseous I reached down, confident I would see the telltale sign of iPhone owner neglect – the spiderweb crack. Luckily, I dodged the bullet and my screen was intact. I thanked the iPhone gods (Steve Jobs and Jony Ives) and swore I would never treat my iPhone so shabbily in the future. But that exact same scenario has occurred no less than five more times since then. Sometimes landing on a rug, or a shoe or car mat. Each time face down, but intact. You see, today, it slipped out of my hands, as I was trying to navigate a subway turnstile. I keep my Metrocard in one of those handy slits on the inside cover, and as I went to move through the turnstile, my forward momentum came to an abrupt halt. Apparently, my Metrocard had not been read. And as a result, my Book Book went flying, opened face down, and SLAP! I knew, I just knew that this was the end. I had mocked the iPhone gods with my empty promises, and it was my day of retribution. You’ve been in the NYC subway system. There’s nothing soft about it. I prepared for my accounting as I swiped my Metrocard (correctly this time) and stooped to retrieve my baby from the cold concrete. On the lower left edge. Barely perceptible, but there nonetheless. I cursed the culprit for my suffering under my breath. 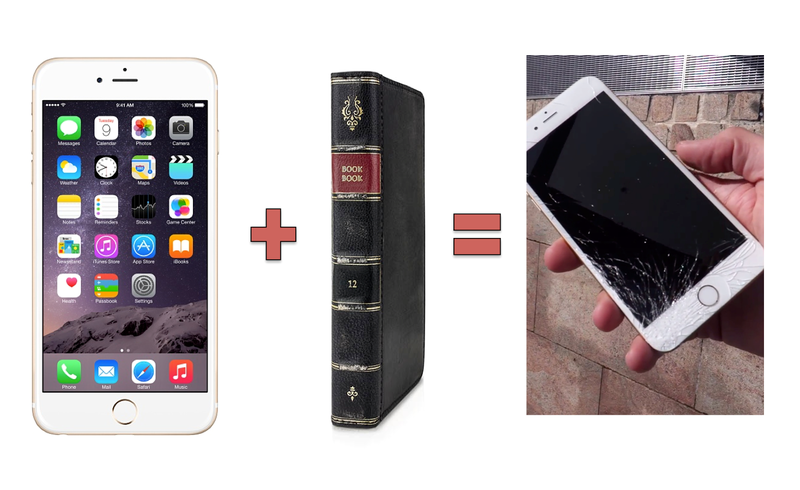 At this moment, I realized what an absolute liability the Book Book iPhone 6 Plus case was. Despite the mounds of empirical data I had to the contrary, I operated under the delusion that my phone was safe in the case. 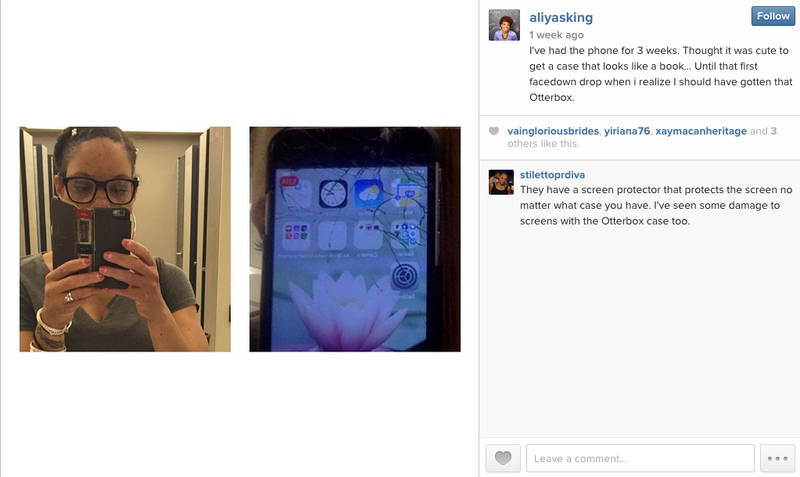 Not less than a week ago, I had told my girl Aliya King, that I felt her pain when she posted a selfie with her spiderweb sporting iPhone 6 Plus in what? I had even replied that I was going to swap my Book Book for an Otterbox or LifeProof for the very same reason. But more than regret, I’m angry. Book Book, you need to either (a) increase the depth of the iPhone holder or (b) figure out a way to keep the case from flying open face down when dropped. But either way you owe me a new iPhone.